I just completed my first of four organizing projects for this month, and I can't wait to photograph it and share it with you! As I initially sat down to plan each problem area and went through all of the whys and hows and thoughts, I found myself reaching for my organizational library. Before I started blogging, there was no such thing as Pinterest. The majority of the ideas I found and utilized were from the pages of (gasp) books and magazines! And no matter what technology continues to throw my way, I will never stop loving a beautiful book or a glossy magazine. I find endless amounts of pleasure just flipping through tangible pages and taking in all of the advice and visual inspiration. In fact, I am an extremely visual person. I am sure there are a lot of really wonderful books that teach organizational principles, however, I find I am much more likely to hop off of the couch and tackle a drawer or closet immediately upon seeing a beautiful photo of one. So, as I grabbed for my big stack of books, I thought that I would take a moment to share my favorites with you. 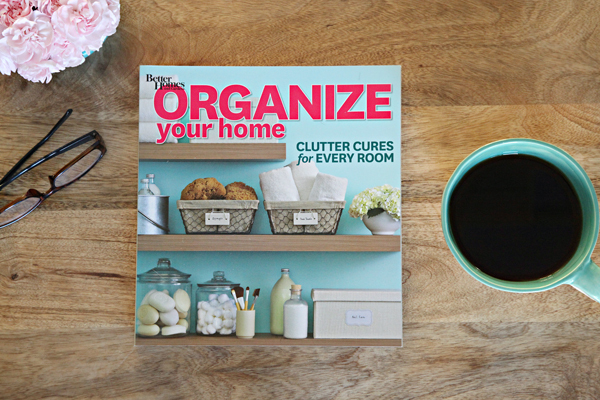 The common thread between each of the books/magazines I am featuring today is that they are all filled to the brim with gorgeous imagery that correlates to a plethora of tips, tricks, advice, strategies and solutions for organizing every last nook and cranny of your home. Unfortunately, some of the books and magazines on my list may no longer be available to purchase online or on newsstands. I didn't want to leave them out of the running though because I have noticed that on occasion publishers will release updated printings, and older versions and copies may be found at second-hand bookstores or are still available through sellers online. Isn't it fun to find out what makes friends, family, and fellow bloggers tick? Well, these books are my vice and love language and receive my attention all year long (but even more so in January). Above and beyond the helpful tips and mighty imagery, here are a few more reasons these books and magazines stay within my reach at all times. 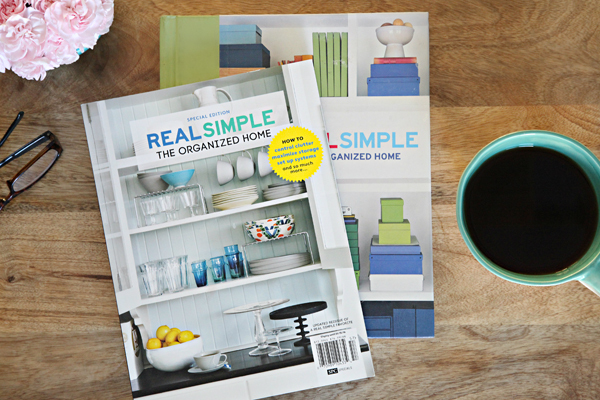 Real Simple, The Organized Home was one of my very first organizing books. The cover is damaged and the pages are falling out, but it remains one of my all-time favorites. Last year an updated version hit newsstands in the form of a bookzine, and it is equally as wonderful. 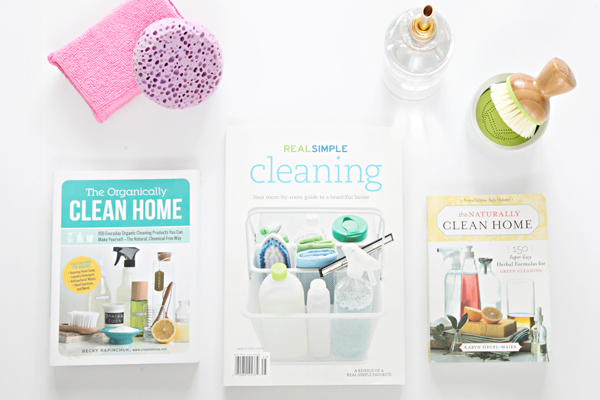 Real Simple's photographs are right in line with their name; simple. And that is what I love about them. They are clean, and therefore inspire me to clean! Both versions of the book will take you room-by-room and not only share ideas and tips for each space, but also identify the basic building blocks to put together a highly functional and easy-to-maintain home. Bonus: Flip to the back pages to find common items that are challenging to let go of, and some guiding principles to aid you in your quest to living with less. 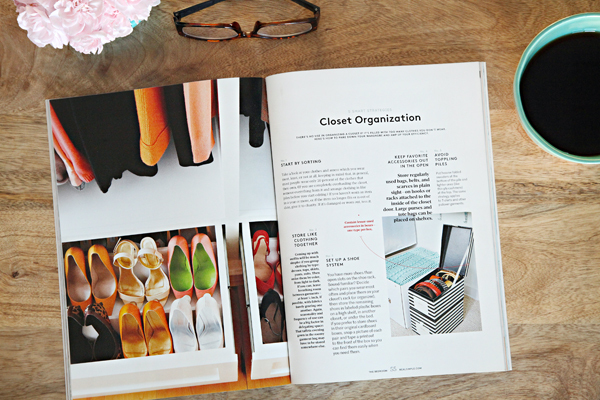 Although Real Simple was my first organizing book, Martha Stewart was my first organizing idol. She was the queen of making organization look beautiful (not sterile or boring). Oh, the details! Painted pantries, decorative label holders, collected canisters... Who would want to mess up any of those lovely systems? I grew up watching Martha on television, and I am still in awe of her tips and craft products and kitchen gadgets. Good Things for Organizing is another room-by-room format, sharing storage solutions for just about anything a space can hold. And the rooms featured are relatable and look lived in, not just staged in a studio. 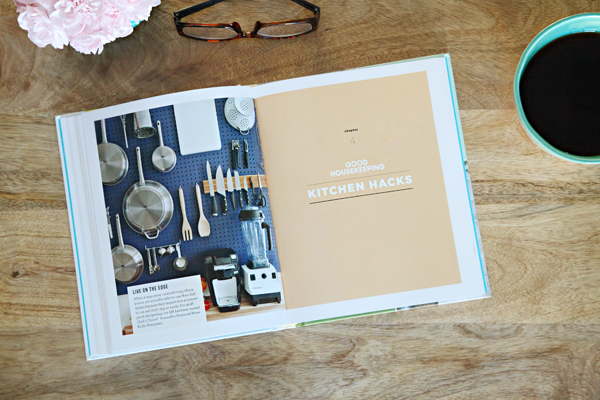 The Martha Stewart Organizing bookzine also includes storage solutions, in addition, it offers quick life hacks like adding grommets to your kitchen towels and rubber gloves so they easily hang on hooks under your kitchen sink. You name it, there is a solution for it! I know not everyone feels the same, but I truly find pleasure in housekeeping. That said, I also want to learn how to do it more efficiently and effectively. 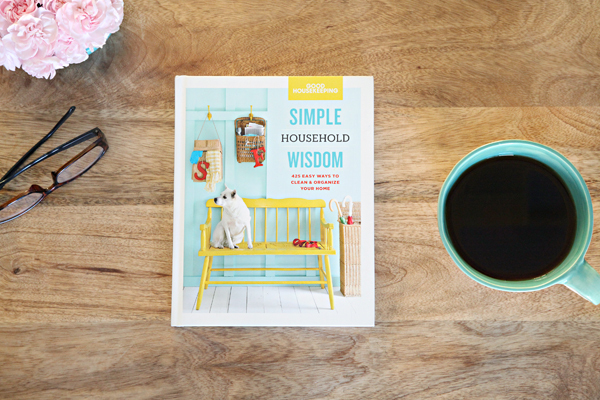 I received the Good Housekeeping Simple Household Wisdom book for Christmas, and it has been a wonderfully quick read complete with tested tricks that are sure to save time and sanity. Did you know dishtowels were deemed the most contaminated spot in the kitchen? Swap those out daily friends! And that you should never use clothing stain remover on the carpet? #guiltyascharged Are you loading your dishwasher with all of your dishes facing inward? That is where the spray is the strongest. Page after page of endlessly helpful tidbits of information. 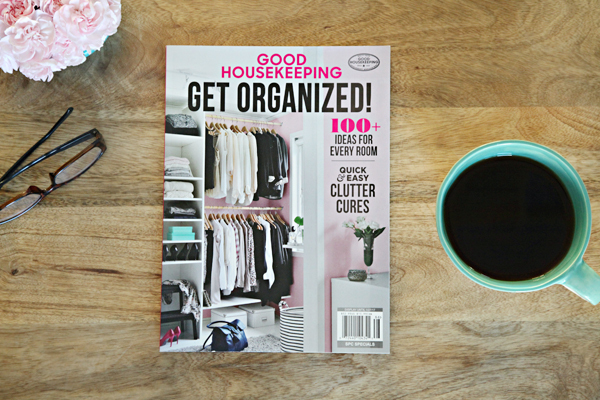 This year I also picked up Good Housekeeping's bookzine titled Get Organized! I figured if they had such good household tips, I had to know what their thoughts were on organization. I absolutely love that these pages are filled with EASY solutions, some that can be done in 8 minutes or less! And with that, they don't offer any more than 8-10 simple tips for any given area. This ensures I don't feel overwhelmed or discouraged to tackle my bedroom closet or my overflowing desk drawers. So approachable and motivating! I think that I am meant to be a resident of Canada (heck, a few hour drive and I suppose I could be!). Their designers and editorials for interiors are the ones I find myself seeking out more than any others. Hello! Sarah Richardson! Come and decorate my house, please! 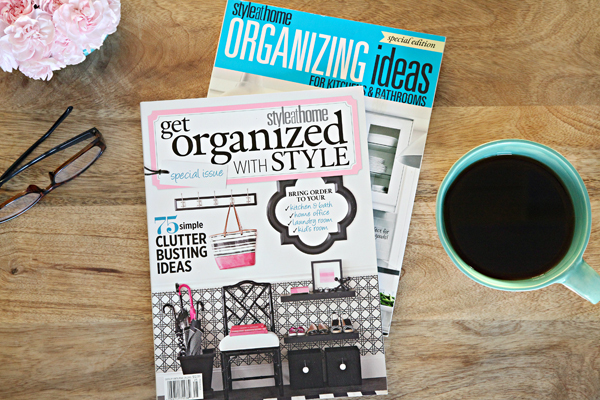 Style at Home Magazine, thank you for sending me a digital copy of your pages every month! You do color SO right! I am truly madly deeply in love with how Style at Home does white, I love how they do color, I love the finishes they showcase and the fresh and clean feeling their spaces emote. 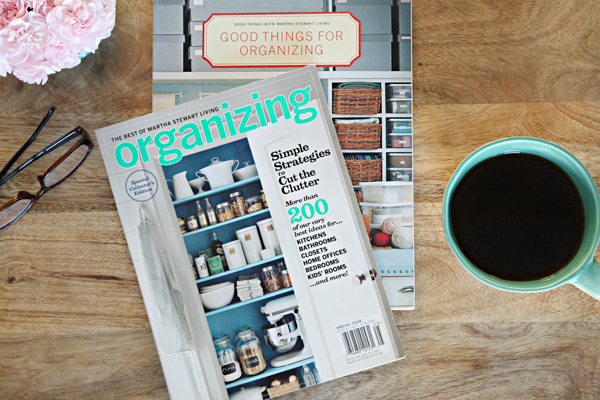 So when I found out they released an occasional special edition issue solely focussed on organization... Wowza! My heart burst into a million little fluttery hearts. And these magazines are everything I hoped they would be and more. 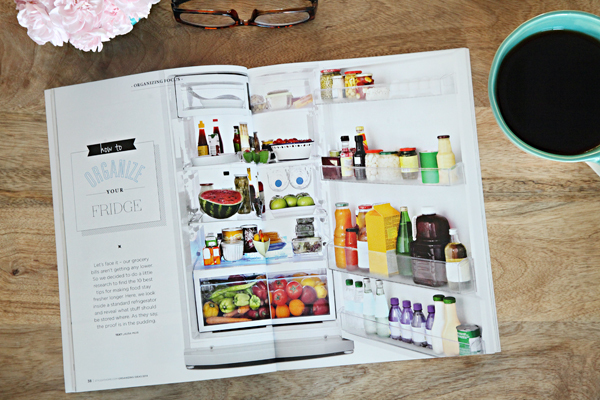 Colorful organization paired with real life tips that blend seamlessly with the decor (always my personal goal). Everything from setting up an effective workspace to maximizing your kitchen cabinet space, they have it covered. It also looks like they have a newer issue I haven't personally flipped through yet, but it was just added to my shopping cart! I am grateful that you can purchase all of their past special edition issues here, I wish more magazine publishers offered that option to their readers. 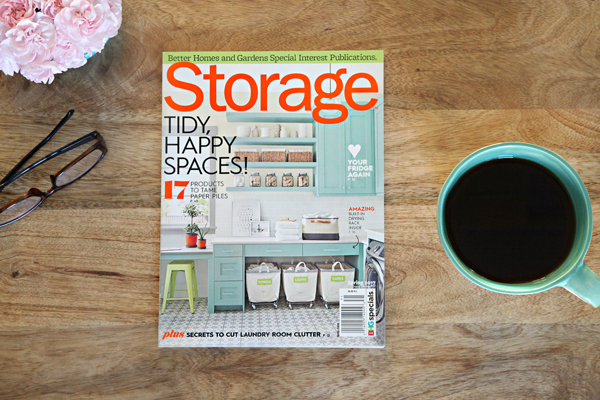 I don't think I have missed an issue of Storage magazine in the last 8+ years! And of course, the magazine has a special place in my heart since they gave us a huge multi-page feature a couple of years back. I had the personal pleasure of working with Better Homes and Gardens for quite a few years, and they really have an impeccable eye for amazing interiors and the specific details that make a house a home. I especially appreciate when they focus on the organizational details that help a home run smoother. I have personally learned quite a bit from this magazine; the clear shoebox drawers under our kitchen sink have been working hard for us for many years now, and switching all of our towel rods to hooks has been life changing for our kids (and ultimately for us as well). 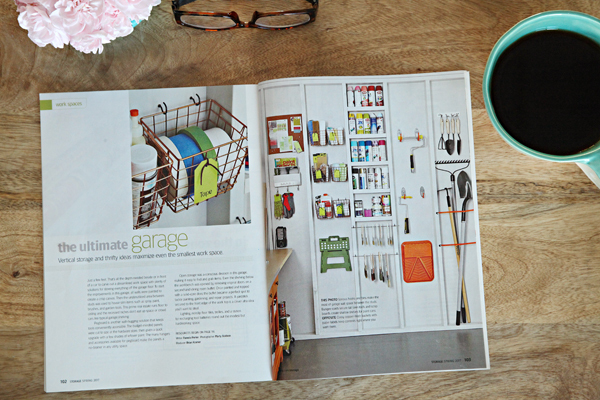 This quarterly publication packs a lot of punch with solutions for every room in the home, garage included, as well as hot new storage and organizational supplies that are designed to simplify daily life. These types of magazines always feel like a splurge, but they are generally ad free and I learn from them so I try to justify it every couple of months. 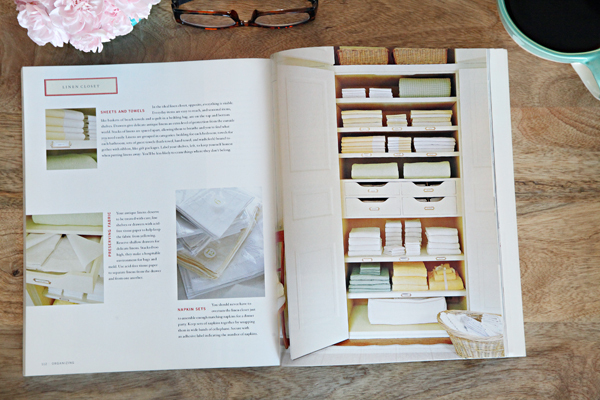 The pages are filled with motivational quotes and quick hits, and this book taught me that labels don't solely have to be made from white and black labeling tape, that beautifully lined drawers make an impact and why clear acrylic organizers will always be my favorite. I also find it helpful that they will show a full room view, and then break it down into smaller details and strategies. Cleaning and organizing go hand-in-hand, and often times folks will resolute to organize spaces around their home, and also to make some changes in the cleaning department. 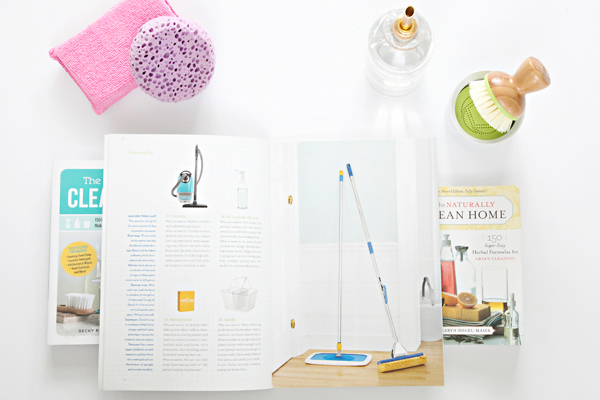 Whether it be to make homemade cleaners, to implement 15 minute daily pick-ups, or to deep clean one room per month, there are a few books that can offer you some guidance. 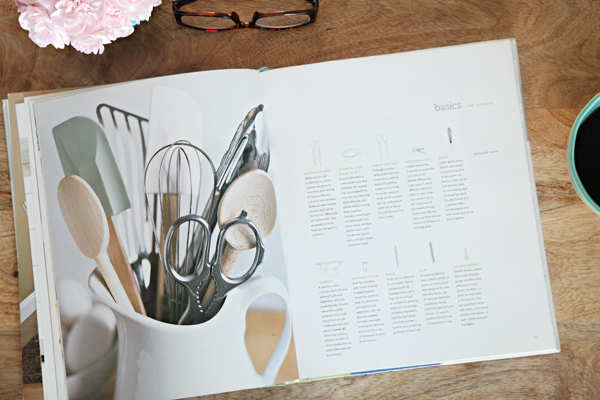 The Organically Clean Home and The Naturally Clean Home are my homemade cleaner bibles. I have quite enjoyed making my own cleaners over the years as there is something so wonderful about knowing all of the included ingredients while saving money and packaging. And with the help of these two books, no matter what the mess, I can find a remedy using items I already have on hand. One of my dear friends, Becky, is about to release her next book, and I am counting the minutes! The girl is a cleaning genius! Not only do visuals of organized desks and closets inspire me to get off my tush and work some magic, sparkly counters and sink fixtures and bright white baseboards motivate me to go clean something! Real Simple Cleaning certainly shares how to make your counters glisten and keep those baseboards white, as well as tips for maintaining household appliances. The photography is stunning and "clean" while the tips are easy and straight forward. Want to put together a solid cleaning kit? This book will help you out with that as well. 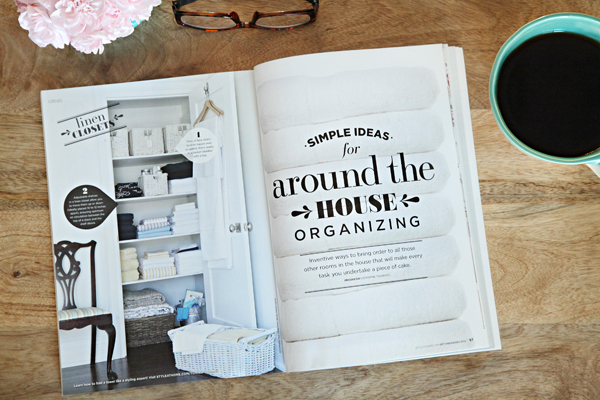 Now when you go room-by-room to organize, you can add a little extra sparkle to your projects! 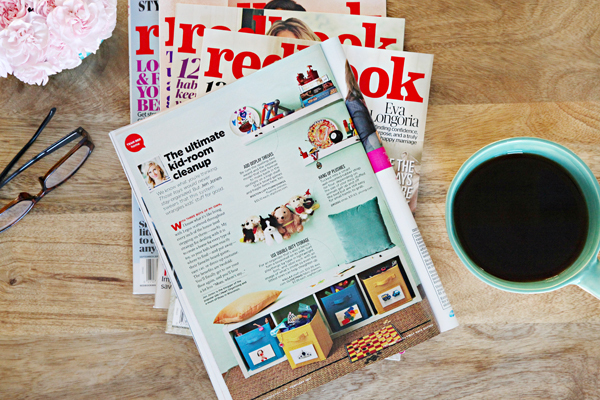 I have learned so much over the years, whether it be through reading and research or trial and error, and I now get to share my favorite tips and tricks monthly as part of an amazing collaboration with Redbook magazine! You can find me on the front pages of each issue, tossing around extremely simple and doable ideas. I have chatted about tips for organizing under the bathroom sink, putting together helpful caddies for around the house, solutions to create the ultimate command station and tips for DIY'ing darling storage boxes. This month we re-created solutions from our boy's playroom while adding in a couple of new elements and ideas! This opportunity has been so much fun and a whole new way to share my love for organizing with the world! Some people collect mugs, others collect baseball cards and vintage tea sets, and I collect organizing books and magazines. When things in my life start to feel a little overwhelming, opening these pages brings me a great sense of calm. And generally all of our organizing projects stem from one of two places; I either grew really frustrated with a particular system and decided to deal with it on the spot, or I saw an amazing picture that sparked a new idea. What inspires you to take on a new organizing project? Are you a need to read about it or need to see it type of person? What organizational or cleaning books should I add to my list? I hope this hasn't posted several times. I keep trying and don't see it. I love your posts and your home is fabulous! Where do you typically find your books and bookzines? I'm really hoping 2017 is my year to purge and organize! Small home and way too much stuff! Thank you! I generally find the books on Amazon and the magazines on newsstands or I will even seek them out at a Barnes & Noble (they have the most extensive magazine inventory I have found for Home & Design). The bookzines are also out on newsstands at Target and grocery stores seasonally. I am ready to do some purging as well! Cheers to a fresh start in 2017! Alibris and Abe Books are also good sources for used and out-of-print books. It won't help anyone own the books, but if anyone wanted to at least look through the material you recommend, the books and magazines might be available through their local library, too. Our local library has a large collection, and they keep several years worth of many magazines, too. They even allow you to check out the latest issue of a magazine. Thanks for mentioning this, Leah! I was going to share this tip as well. I'm a librarian and our library has a great selection of magazines (I'll be checking out INSTYLE and REDBOOK, for sure!) If your library doesn't have a copy of a book they can usually borrow it from another library. They also might be available as ebooks using your library card. Okay...stepping off my soap box now. Thanks for all the ongoing inspiration, Jennifer! Thanks for the inspiring post! I have been in a "homemaking rut" ever since moving 4 years ago (We had to pursue arbitration with the previous owners over well-hidden major problems - so it has been a few tough years with the addition of other issues in life.) As I try to pick myself up out of crisis-mode and get inspired once again, I just realized in those tough years, many of my subscriptions ran out or didn't move with us and my inspiration has been stale, boring or unattainable. Even with Pinterest *gasp!*. I too, enjoy the more tactile pages of a book or magazine rather than the rabbit-hole of clicking though images that get buried in my internet history. Thanks for the post! 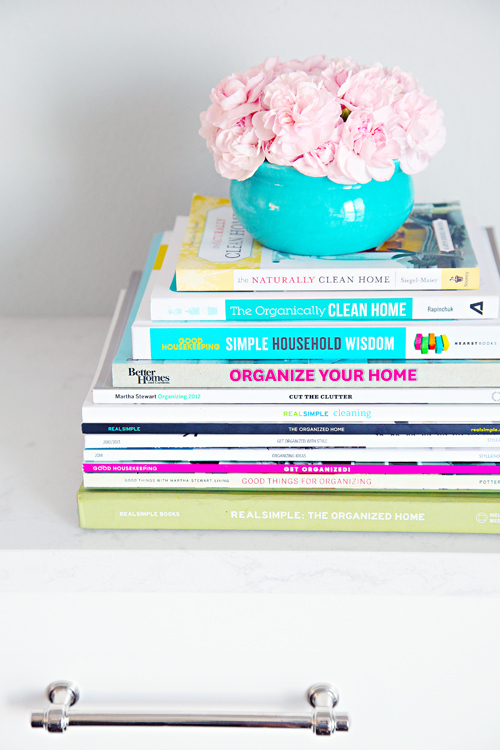 I've been in major purging/nesting mode lately, and I totally need to check some of these out! And honestly, I'd never thought about it before, but I find genuine pleasure in housekeeping, too. Love this post! Honestly, your blog is one of my main organization inspirations! 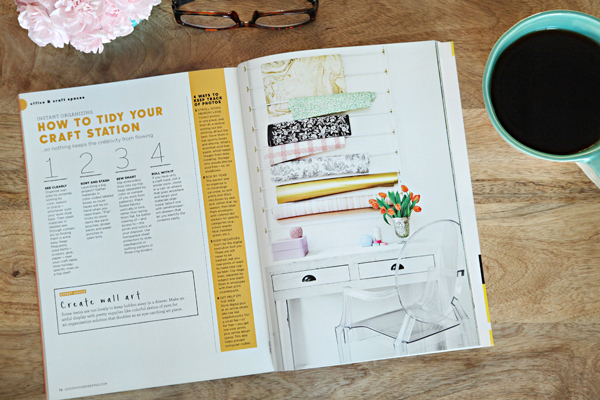 When I want to see pretty, fresh, clean and organized spaces I click over to your site. 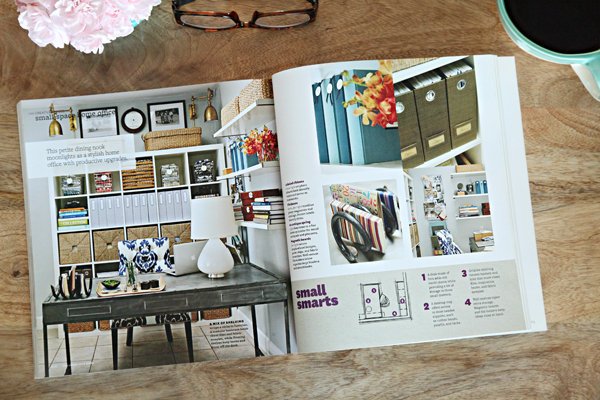 It is truly eye candy for the organization/decor lover. :) I don't read a lot of blogs these days, but yours is one of them. Happy new year! 2017 is my year to purge and get organized -- the hardest for me being the "purge" part, as I am a sentimental person (to a fault) and think that everything has a "memory" and I might regret getting rid of it one day. With ten children that means tons of papers, crafts, notes, pieces of art, not to mention all the books (I always thing they are going to be read by the next child, but that hasn't always been the case...yet we have a mini library over here!) all the toys and clothes...and don't even get me started on all the socks in this house. Whoa. But I think this year I'm going to get the courage to do a major purging of the things we don't use or need anymore. Thanks for the inspiration! WOW! 10 children! I can only imagine what organizing for that many kiddos would be like. And I can understand the challenges of purging their work and memories. Hopefully you can find an easy way to digitize many of your favorites so it won't be quite as painful. Best of luck Katrina! You got this! I found you're blog this Christmas I don't really know how, and I Heart it! I'm from Spain, working mother of triplets aged 5, so routines, timetables and organisation has always been sooo important for us, as you can imagine. You're blog is inspiring me a lot, taking it easy, as my house is really a mess by the end of every day. I have always done many organization projects, but never ended up well, as I had no preparation an developing. So I'm learning so much from you. Best of lucks for this 2017, I will continue reading you!! I think it's something about this time of year, because I have also been in a major nest/purge/organize mood. Thanks for the resources! Hi! Thanks for this post-I own some of your book suggestions thanks to previous posts of yours! My question is, how do you organize and not clutter your space with all of the magazines and books? I find myself keeping so many (magazines especially), that I just put them all in a big basket which makes it really hard to find what I might need later. I let many of my books double as decor, they look beautiful stacked on our bookshelves, coffee tables, nightstands, etc... We also utilize the library frequently to cut down on the number of excess books around the house (and donate ones that are no longer useful). Magazines though, I literally have "issues" when it comes to magazines. Ha! I have been collecting magazines for so many years now, that it is way out of control. It is on my list of items to deal with this year, and I will be sure to share what I come up with. xoxo! Thank you for the great resources! It's good to many different ones since people live in their home and organize it different ways. You're tips are great! I look forward to more from you! These books and magazines look like a ton of helpful tips! I'm going to have to check some of them out. whenever I need inspiration, I resort to blogs or pinterest. Hi Jen- your blog is a major inspiration for me so it was fun to see where a lot of YOUR inspiration comes from. My first organizing love was Martha Stewart too and Thanks for the Canadian shout out. Sarah RIchardson is awesome! Lovin' your blog from Whitby, ON, Canada! !